This is a stunning image of the Carina nebula. It is located somewhere between 6,500 and 10,000 light years from Earth or right in our Milky Way. This image was taken in infrared by the European Southern Observatory. It holds two of the most massive and luminous stars in our galaxy called Eta Carinae and HD 93129A. Eta Carinae is about 100-150 times the mass of our sun and is 4 million times more luminous than it as well. Carina Nebula is a great example of how massive stars are born as well as the aftermath of being ripped apart leaving waves of gas everywhere. It’s a highly active region and is thought to be around for the last 3 million years. If you were to travel across the Carina Nebula it would take you about 260 light years. Some of the hidden secrets of the Carina Nebula lie with the Eta Carinae as it will eventually supernova or hypernova. 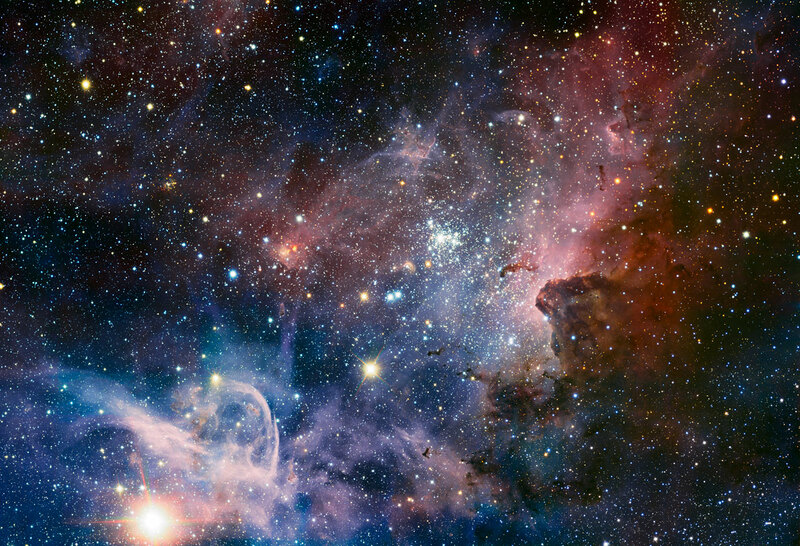 The amount of mass the Carina Nebula holds is around 900,000 total suns! Carina nebula is also home to some famous iconic images such as the Mystic Mountain. The Carina Nebula has been studied quite often and many papers have been published because it’s right in our own neighborhood as well as a great star production factory.